Gwen Stefani’s Outfit Travels Back To The 90s, Her Body Doesn’t Have To! Quite possibly the hottest mom in music, Gwen Stefani just keeps wowing us with her age-defying looks and awesome sense of style! And as if to prove age don't mean a thing, the No Doubt singer revisited some of her signature 90s styles--and looks even better now than she did almost 20 years ago. At a private concert in Paris last night, Stefani rocked a belly-flaunting velvet halter top, plaid harem pants and knee-high patent leather combat boots. The ensemble is very similar to the one she wore in No Doubt's 1995 music video for their single "Spiderwebs", but with some twists that only a fashion mogul like Stefani could add. The striped and tulle tails in the back of her pants are the perfect compliment for jumping around the stage, and her Hermès pyramid spike cuff is certainly a far cry from the Hot Topic ones she surely was wearing back in the day. Her makeup and hair has had years of professional refinement since the 90s, so of course she would be looking better than her 20s self. Oh, and her big honkin' diamond wedding ring is kind of an upgrade too. But the real test of time has been the singer's killer bod! Gwen Stefani has always been known for having a stomach you could bounce quarters off all day, but even after giving birth to two children she's looking better than ever. Flawless face, toned arms, abs that bring tears to your eyes--is there a horrific secret she's keeping that is the key to looking that fit and fabulous at 43? Do we all need to start walking into spiderwebs? 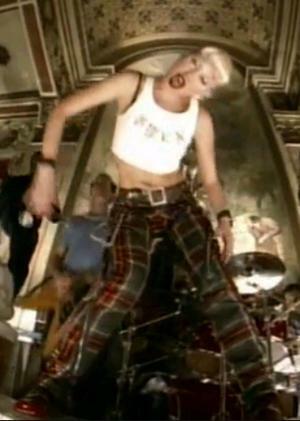 Even 1995's Gwen Stefani would be pulling her platinum hair out in envy!